A photo of the carpenter class of the Forest Grove Indian Training School. The ten young men are in western dress and are performing various carpentry tasks. A complete dresser stands in the background. From front of photo: Davidson, Photo. No. 42. 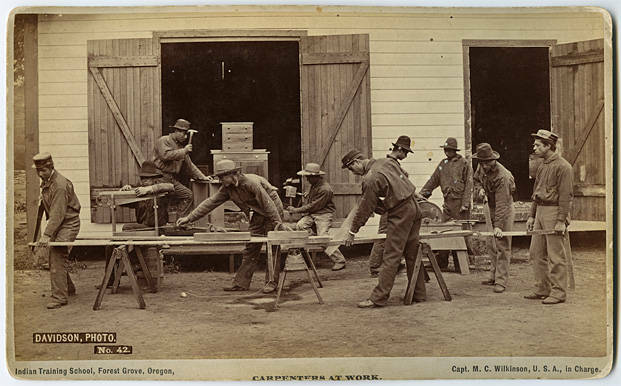 Indian Training School, Forest Grove, Oregon, Carpenters at Work. Capt. M. C. Wilkinson, U. S. A., in Charge. From back of photo: I. G. Davidson, Photographer, Portland, Oregon, received the Highest Award at the Portland Mechanic's Fair, 1881, for Views of Oregon and Columbia River Scenery.